Two weeks ago, Yi and I were talking about living in Europe permanently. She tells me 4-5 times daily that she doesn't want to leave Nederlands, that she loves the people, her course mates, and everything here. It really is very pleasant here. People are so nice. I never felt any racism in Australia but I was aware I wasn't in my own country even though downtown Melbourne is like Hong Kong. I can't put my finger to it. I feel very at home here even though the Asian population is so small. We stand out totally. I think Europe is the most racially un-racial country I'v been to. My own country is very racial. Everyday the issues in newspapers are about race. After years of brain-washing, you begin to think like they want you to think, you become race-conscious. When I first saw black and white couples with their kids (plenty in Europe), I was shocked. 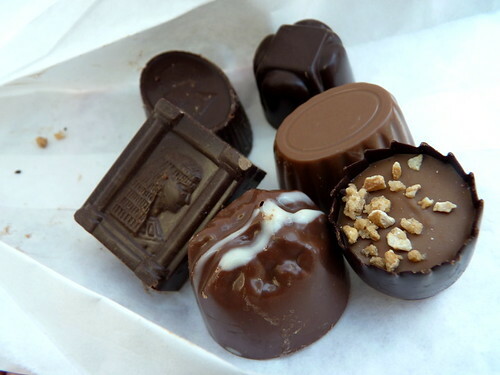 Milk + dark choc = milk chocolate. Don't blame me, I come from a country that propagandizes racial integration but has exclusive political parties for different races and different policies for different people. Students have to reveal their race and religion on government exam papers. And just a few days ago, an ex-prime minister blatantly warned people of his own race that they will become a minority if they don't watch their backs. He said it with total arrogance and disregard about how people'll feel as long as his purpose is attained and that is to instill fear and discord. The whole of Asia actually is very race-conscious, when you think of it. It all comes down to narrow-mindedness, ignorance and lack of tolerance and respect. Today I've changed my mind about living in Europe. Over the past week, the temperature plunged to 8 C at night, about 15 C in the day and the heater' shut off because it's now officially summer. My fingers are always cold, my face is wrinkled. I'm wearing my daughter's clothes and she's wearing mine (we had Hub take our clothes back so we can travel light) and she wears the pjs top, I get the bottom. Hub called and said "Why suffer there, come home where you can be queen!" Then he told me what he had for lunch and dinner and it didn't work; I still don't miss the food. Remember in one post I told you that western food is boring? The last 3 weeks I've been cooking Chinese for lunch and western for dinner and I realize that it's not that western food is boring. It was eating out 3 meals a day for 12 days straight on tour that made me uncomfortable. The last 3 weeks when I cook and eat whatever I fancy, I'm so much happier. There's so much food here and they are SO fresh. Veggies squeak when I wash them. Meat is so fresh they have no odor. You don't need msg or stock powder or heavy condiments and spices. I'm not homesick for KK food at all. 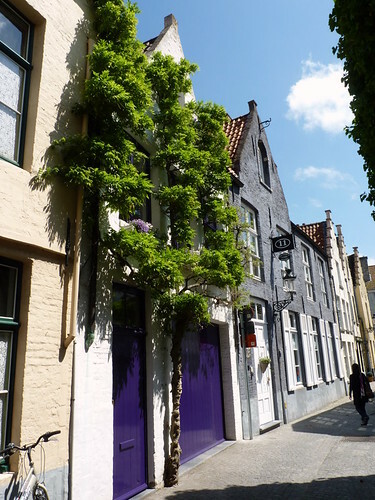 Last week, Yi and I took a short trip to Bruges (Brugge to the locals), a small Belgian town that's very pretty, medieval and deserted except for tourists. I think the young people have all left the town. 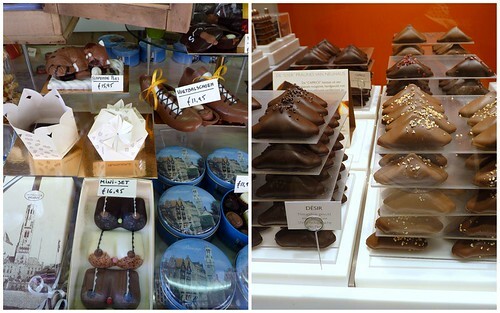 there's no need to specially make a trip to Bruges unless it's on your way. 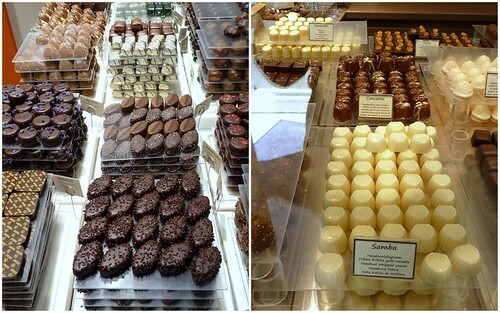 It's nice, yes, but there's really not much there except lots and lots of Belgian chocolates. 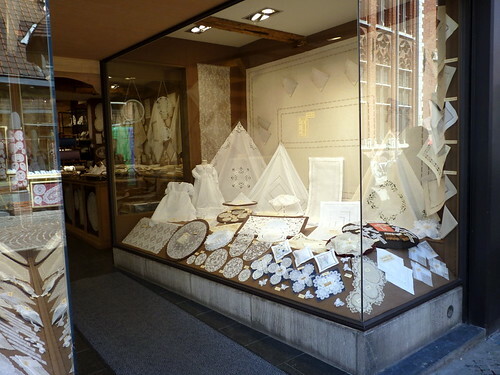 And now I will reveal a traumatic experience I had in Bruges. I left the accomodation to Yi. She said it would be in a nice hostel that she'd been before. We had a hostel experience in Rome too, but I'll tell you when we get to the Rome posts. Story short, even though we had reservations, there were no more twin sharing rooms when we arrived and we had to share the room with two strangers. I was unhappy but unhappiness turned to worry when the strangers were guys. Story short, I was scared stiff and held on to my wallet all night. I didn't sleep at all. But to be fair, Shaun and the other guy were extremely good, no noise at all and they didn't shower, which, in hindsight, is a pity because there was no door, just a shower curtain. Tall and cute. And young. So now that I've been to the extreme in accommodation, I am happy to say that hostels are really a good deal. The rooms are very clean and big. 18 euros per pax. If you are going to be touring for a few weeks, this is the wisest option. Save your money for food and entrance fees. This hostel was in the town too and it's a great place to meet (young) people. People were watching football and drinking in the lounge; I felt like I was 20. When Korea scored a goal, they groaned and then looked at us and kept quiet. So funny. The Belgian journalist Jo Gérard recounts that potatoes were fried in 1680 in the Spanish Netherlands, in the area of "the Meusevalley between Dinant and Liège, Belgium. The poor inhabitants of this region allegedly had the custom of accompanying their meals with small fried fish, but when the river was frozen and they were unable to fish, they cut potatoes lengthwise and fried them in oil to accompany their meals." 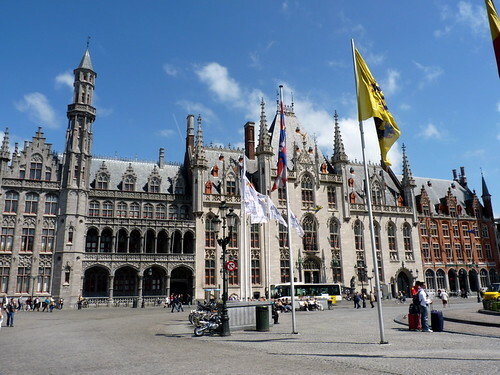 Many Belgians believe that the term "French" was introduced when British or American soldiers arrived in Belgium during World War I, and consequently tasted Belgian fries. They supposedly called them "French", as it was the official language of the Belgian Army at that time. 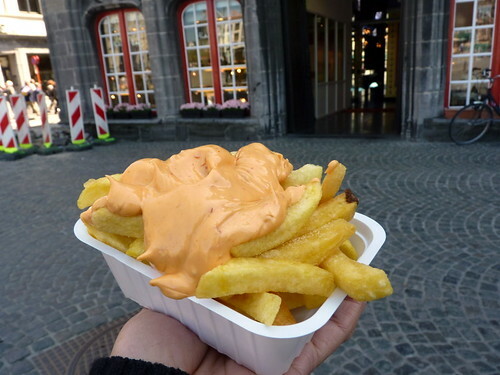 "Les frites" (or "Frieten") became the national snack and a substantial part of several national dishes. Belgian fries are fried in animal fat and are thick, meaty, crispy out and fluffy in, real yummy! I don't like them with mayo though. Too rich. We saw a guy order this in the hostel and did the same. 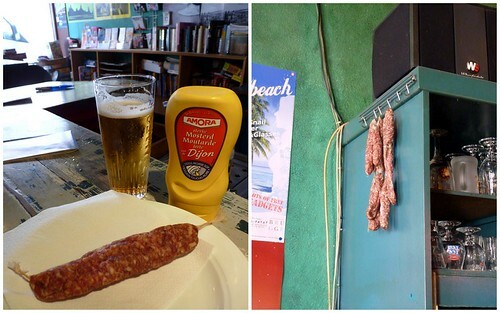 1 euro per sausage. It tasted like jerky sticks. 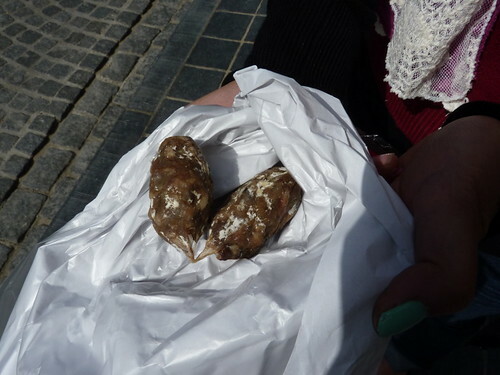 Yi bought these turd-like sausages for 75 euro cents. They tasted so bad. They smelt like Kimber, our terrier, after she had her puppies. Btw, do you know that in Europe a comma is a period/full stop and vice versa? An ice cream cone would be 2,50 and a camera 2.500 euros! Terri, I've just left a reply about the Artwear Dimitriadis necklace on Paris post. Their website is down so I don't know who their stockists in London are. But these came up when I did a search on google. Not a big selection though. BTW, I love your candid and honest post and photos. I don't think I'll ever return to Malaysia to live. Racial integration?! Yeah, right. How I wish food here is as fresh as you have experienced. i can hardly imagine veggies squeaking as you wash them! nothing like home cooking Terri! Hey Terri, I had the same feeling about Germany being unracist wben I first arrived too, but after a while ... I do feel it somehow although it is not as verbal as back home with the top-guns showing great example. Ah well .. there´s no perfect place to live eh. I live in Berlin and I think it is one of the most undiscriminating citys in Germany 'cause Berlin is so multiculti. But when I'm in former East Germany or in very small towns I feel what Lianne feels...until I open my mouth and talk with people...then they realize that I'm not very different from them.